Brave the chill and stay on-trend? Challenge accepted. We show you how. It may be cold outside, but that’s no reason to downgrade your style. Regardless of the season, layering with texture is the new cool. With the right set of pieces you can easily take your wardrobe from drab to fab this winter. Here are five ways to beat the cold and stay stylish. 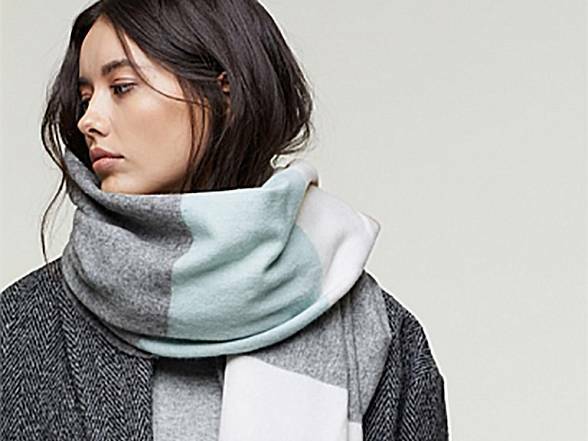 The oversized scarf is one of winter’s most hardworking items. This season we see scarves getting chunkier, fluffier and so much brighter. Swap last year’s skinny knitted and printed fabric scarves for blanket-inspired fuzzy, faux fur or giant-stitch woollen ones. Key prints include houndstooth and checks, while hot colours include apple green, tangerine, and reds. Features such as colour blocking and pearl-knit patterns reign this winter, as does patterned faux fur. It’s about contrasting colours with patterns and textures. Finding the perfect coat is essential to a cosy and stylish winter. Luckily this season we’re spoilt for choice. Expect to see everything from shearling teddy coats and textured biker jackets to deconstructed puffers and tailored full-length coats. Texture is an important part of the seasonal trend, so look out for faux fur collars, shearling trim, vinyl finishes and furry strips. The quilted jacket also features strongly – invest in the very-hot-right-now cropped version (it ends along the bust line), or look out for a longer length option for a more cocooning effect. If fluffy, furry fashion isn’t to your taste, keep things simple by teaming up a turtleneck, slim-fit mixed texture coat and cute ankle boots. Ah, fingerless gloves! They return this season as a key accessory to that well-layered look, so be sure to select one of the many stylish options available this winter to help keep the nip out. Textures such as mohair, cashmere, alpaca and merino wool feature strongly, so opt for the best you can afford. Features such as suede and leather trim inserts and pearl knit patterns add extra dimension to the look. To make a bold fashion statement, choose full-fur mittens (that’s right, they’re straight off the runway and so hot this winter). Layering with dresses may sound bulky and frumpy, but it’s anything but if styled correctly. Dress up chunky, oversized knits over flowy dresses (a great way to get more wear out of your favourite summer frocks! ), or pair a slim-fit turtleneck with a textured pinafore dress. For a more polished look, the season’s star style pairing features a sheer dress worn over jeans and turtleneck, teamed up with a textured biker jacket and scarf. Want a simple way to make your outfit season-ready? Simply add a crossbody bag. From slim sling purses to bigger crossbody totes, this trend has something for everyone: fluffy, furry textures for the fashionista, soft leather for the minimalist, and bold stripes and patterns for those looking to make a lively fashion statement. Wide straps with stripes, slogans and floral prints add further interest to the look. © Copyright The Crossing 2018. Proudly managed by Colliers International Real Estate management.